Risk this is defined as the combination of the probability of an event and its consequences. In all types of undertaking, there is the potential for events and consequences that constitute opportunities for benefit (upside) or threats to success (downside). Risk Management is increasingly recognised as being concerned with both positive and negative aspects of risk. Therefore this policy considers risk from both perspectives. Risk management is a central part of the B & W Plant Hire and Sales Ltd strategic management. It is the process whereby we methodically address the risks attaching to their activities with the goal of achieving sustained benefit within each activity and across the portfolio of all activities. The focus of good risk management is the identification and treatment of these risks. Its objective is to add maximum sustainable value to all the activities of the organisation. It marshals the understanding of the potential upside and downside of all those factors which can affect the organisation. It increases the probability of success, and reduces both the probability of failure and the uncertainty of achieving our overall objectives. Strategic – These concern the long-term strategic objectives of the organisation. They can be affected by such areas as capital availability, sovereign and political risks, legal and regulatory changes, reputation and changes in the physical environment. Operational – These concern the day-today issues that the organisation is confronted with as it strives to deliver its strategic objectives. Financial – These concern the effective management and control of the finances of the organisation and the effects of external factors such as availability of credit, foreign exchange rates, interest rate movement and other market exposures. Knowledge Based – These concern the effective management and control of the knowledge resources, the production, protection and communication thereof. External factors might include the unauthorised use or abuse of intellectual property, area power failures, and competitive technology. Internal factors might be system malfunction or loss of key staff. Compliance – These concern such issues as health & safety, environmental, trade descriptions, consumer protection, data protection, employment practices and regulatory issues. 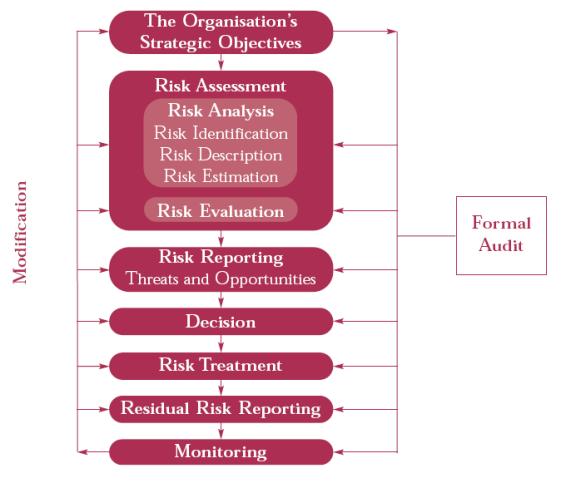 As part of the annual strategic review each identified risk is described in a structured format is necessary to ensure a comprehensive risk identification, description and assessment process. Risk estimation is assessed as high, medium or low using the guidelines shown in the tables below.